CCMT MTECH 2017 Mechanical GATE CUTOFF FOR NIT'S AND BEST STATE ENGINEERING COLLEGE - Sarkarinewjob.com A ultimate job portal to provide employment news. Centralized Counselling for M.Tech./M.Arch./M.Plan./M.Des. admissions (CCMT) 2018 is an on-line admission process for all National Institutes of Technologies (NITs) and several other institutes viz. IIITM Gwalior, PDPM IIITDM Jabalpur, IIITDM Kancheepuram, IIIT Vadodara, SLIET Longowal, NIFFT Ranchi, SPA Vijayawada, PEC Chandigarh, IIIT Allahabad, Central University of Rajasthan, University of Hyderabad, Central University of South Bihar Patna, Shri Mata Vaishno Devi University Katra and IIEST Shibpur. As decided by the Core Committee, Counselling for centralized admission to postgraduate programs in all these institutes will be starting from 1st week of April 2018. The Centralized Counseling for M.Tech./ M.Arch./ M.Plan./M.Des. (CCMT) is a convenient platform for the students to apply for M.Tech./ M.Arch./ M.Plan./M.Des. programmes, based on their GATE score of years 2016, 2017 and 2018, in all NITs and reputed Centrally Funded Technical Institutions namely Central University of Rajasthan, ABV-IIITM Gwalior, IIITDM Jabalpur, IIIT Allahabad, Sant Longowal Institute of Engineering and Technology (SLIET) Longowal, Indian Institute of Engineering Science and Technology (IIEST) Shibpur, National Institute of Foundry and Forge Technology (NIFFT) Ranchi, School of Planning and Architecture (SPA) Vijayawada, Punjab Engineering College Chandigarh, IIITD&M Kancheepuram, IIIT Vadodara, Shri Mata Vaishno Devi University Katra, University of Hyderadad, and Central University of South Bihar Patna. This centralized system has replaced the older system, wherein students had to apply individually to various Institutes and go to every Institute for appearing in interview/counseling. The older system caused a lot of difficulties to students such as filling multiple applications, travelling long distances to various Institutes across the country and missing some Institutes due to overlapping admission dates. The Centralized counseling has provided a system wherein the students can fill single online application form from their homes and apply to all programmes in all the participating institutions to which they are eligible. The overall convenience of students has been enormously increased due to centralized counseling. The CCMT was initiated in the year 2012 onwards for centralized admission for PG programmes. The CCMT was successfully organized by SVNIT Surat in the year 2017. 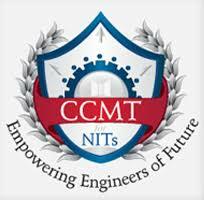 This year, CCMT is being organized by National Institute of Technology Delhi, Delhi. Opportunities available for Mechanical Engineering Student for doing Masters in Various Centrally Funded Institute (CFI’s) through CCMT Counseling with their Respective Score in GATE-2018, GATE-2017, GATE-2016. It is Important to Note that, in case of Tie of GATE Score, Old GATE Score should be Given Preference for the Final Selection, So if someone have better GATE Score in previous GATE then try to use that GATE Score for the Counseling. Machine Design: G-597, O-541, SC---, ST….. The Above Mentioned Cut Off are after 2nd Round of Counseling, So if You belong to these GATE Score then you will definitely get the Particular Institute. The Cut Off of 3rd Round of Counselling is Unpredictable It may be the same, It may fluctuate down to 10-50 GATE SCORE. For any Further Details about any Course, Visit the Website of Particular Institute & Grab the Contact Number of any Professor and then ask your all doubt. !